This article is about the mythological Trojan Horse. For the type of malware, see Trojan horse (computing). For other uses, see Trojan horse (disambiguation). The Trojan Horse is a story from the Trojan War about the subterfuge that the Greeks used to enter the independent city of Troy and win the war. In the canonical version, after a fruitless 10-year siege, the Greeks constructed a huge wooden horse, and hid a select force of men inside including Odysseus. The Greeks pretended to sail away, and the Trojans pulled the horse into their city as a victory trophy. That night the Greek force crept out of the horse and opened the gates for the rest of the Greek army, which had sailed back under cover of night. The Greeks entered and destroyed the city of Troy, ending the war. Metaphorically, a "Trojan Horse" has come to mean any trick or stratagem that causes a target to invite a foe into a securely protected bastion or place. A malicious computer program which tricks users into willingly running it is also called a "Trojan horse" or simply a "Trojan". The main ancient source for the story is the Aeneid of Virgil, a Latin epic poem from the time of Augustus. The event is also referred to in Homer's Odyssey. In the Greek tradition, the horse is called the "wooden horse" (δουράτεος ἵππος dourateos hippos in Homeric/Ionic Greek (Odyssey 8.512); δούρειος ἵππος, doureios hippos in Attic Greek). According to Quintus Smyrnaeus, Odysseus thought of building a great wooden horse (the horse being the emblem of Troy), hiding an elite force inside, and fooling the Trojans into wheeling the horse into the city as a trophy. Under the leadership of Epeius, the Greeks built the wooden horse in three days. Odysseus's plan called for one man to remain outside the horse; he would act as though the Greeks had abandoned him, leaving the horse as a gift for the Trojans. An inscription was engraved on the horse reading: "For their return home, the Greeks dedicate this offering to Athena". Then they burned their tents and left to Tenedos by night. Greek soldier Sinon was "abandoned", and was to signal to the Greeks by lighting a beacon. In Virgil's poem, Sinon, the only volunteer for the role, successfully convinces the Trojans that he has been left behind and that the Greeks are gone. Sinon tells the Trojans that the Horse is an offering to the goddess Athena, meant to atone for the previous desecration of her temple at Troy by the Greeks, and ensure a safe journey home for the Greek fleet. 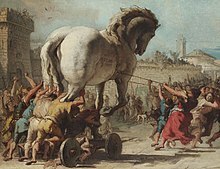 Sinon tells the Trojans that the Horse was built to be too large for them to take it into their city and gain the favor of Athena for themselves. While questioning Sinon, the Trojan priest Laocoön guesses the plot and warns the Trojans, in Virgil's famous line Timeo Danaos et dona ferentes ("I fear Greeks, even those bearing gifts"), Danai (acc Danaos) or Danaans (Homer's name for the Greeks) being the ones who had built the Trojan Horse. However, the god Poseidon sends two sea serpents to strangle him and his sons Antiphantes and Thymbraeus before any Trojan heeds his warning. According to Apollodorus the two serpents were sent by Apollo, whom Laocoon had insulted by sleeping with his wife in front of the "divine image". In the Odyssey, Homer says that Helen of Troy also guesses the plot and tries to trick and uncover the Greek soldiers inside the horse by imitating the voices of their wives, and Anticlus attempts to answer, but Odysseus shuts his mouth with his hand. King Priam's daughter Cassandra, the soothsayer of Troy, insists that the horse will be the downfall of the city and its royal family. She too is ignored, hence their doom and loss of the war. The most detailed and most familiar version is in Virgil's Aeneid, Book II (trans. A. S. Kline). they pretend it's a votive offering: this rumour spreads. cavernous insides with armed warriors. and shouts from far off: "O unhappy citizens, what madness? any Greek gift's free of treachery? Is that Ulysses's reputation? or it hides some other trick: Trojans, don't trust this horse. Whatever it is, I'm afraid of Greeks even those bearing gifts." Well before Virgil, the story is also alluded to in Greek classical literature. In Euripides' play Trojan Women, written in 415 BC, the god Poseidon proclaims: "For, from his home beneath Parnassus, Phocian Epeus, aided by the craft of Pallas, framed a horse to bear within its womb an armed host, and sent it within the battlements, fraught with death; whence in days to come men shall tell of 'the wooden horse,' with its hidden load of warriors." There has been speculation that the Trojan Horse may have been a battering ram or other sort of siege engine resembling, to some extent, a horse, and that the description of the use of this device was then transformed into a myth by later oral historians who were not present at the battle and were unaware of that meaning of the name. 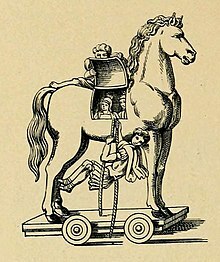 Assyrians at the time used siege machines with animal names, often covered with dampened horse hides to protect against flaming arrows; it is possible that the Trojan Horse was such. Pausanias, who lived in the 2nd century AD, wrote in his book Description of Greece "That the work of Epeius was a contrivance to make a breach in the Trojan wall is known to everybody who does not attribute utter silliness to the Phrygians" where, by Phrygians, he means the Trojans. The Phoenician ship called "hippos". From the Assyrian city of Khorsabad, VIII century BC. Some authors have suggested that the gift might also have been a ship, with warriors hidden inside. It has been noted that the terms used to put men in the horse are those used by ancient Greek authors when describing the embarkation of men on a ship, and that there are analogies between the building of ships by Paris at the beginning of the Trojan saga and the building of the horse at the end; ships are called "sea-horses" once in the Odyssey. This view has recently gained support from naval archaeology: ancient text and images show that a Phoenician merchant ship type decorated with a horse head, called hippos (=horse) by Greeks, became very diffuse in the Levant area around the beginning of the first millennium BC, being used to trade precious metals, and sometimes to pay tribute after the end of a war; it is suggested therefore that the original story viewed the Greek soldiers hiding inside the hull of such a vessel, possibly disguised as a tribute, and that at some time this term was misunderstood in the oral transmission of the story, giving origin the Trojan horse myth. A more speculative theory, originally proposed by Fritz Schachermeyr, states that the Trojan Horse is a metaphor for a destructive earthquake that damaged the walls of Troy and allowed the Greeks in. In his theory, the horse represents Poseidon, who as well as being god of the sea was also god of horses and earthquakes. This theory is supported by the fact that archaeological digs have found that Troy VI was heavily damaged in an earthquake, but is hard to square with the mythological claim that Poseidon himself built the walls of Troy in the first place. 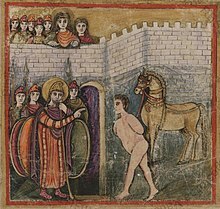 Pictorial representations of the Trojan Horse earlier than, or contemporary to, the first literary appearances of the episode can help clarify what was the meaning of the story as perceived by its contemporary audience. There are few ancient (before 480 BC) depictions of the Trojan Horse surviving. The earliest is on a Boeotian fibula dating from about 700 BC. Other two are on relief pithos vases from the adjoining Grecian islands Mykonos and Tinos, both generally dated between 675 and 650 BC, the one from Mykonos (see figure) being known as the Mykonos vase. (Historian Michael Wood, however, dates the Mykonos vase to the 8th century BC, before the written accounts attributed by tradition to Homer; and concludes from that evidence that the story of the Trojan Horse existed before those accounts were written.) Other archaic representations of the Trojan horse are found on a Corinthian aryballos dating back to 560 BC (see figure), on a vase fragment to 540 BC (see figure), and on an Etruscan carnelian scarab. The earliest known depiction of the Trojan Horse, on a bronze fibula (ca. 700 BC). Note the wheels and the square openings on the horse's side. Warriors leaving the Trojan Horse; Fragment of an attic black-figure krater from Orbetello (Italy); ca. 540 BC. ^ Broeniman, Clifford (1996). "Demodocus, Odysseus, and the Trojan War in "Odyssey" 8". The Classical World. 90 (1): 3–13. JSTOR 4351895. ^ "Virgil:Aeneid II". Poetryintranslation.com. Retrieved 10 August 2012. ^ Homer, Odyssey, 4. 274-289. ^ Virgil. The Aeneid. Trans. Robert Fitzgerald. New York: Everyman's Library, 1992. Print. ^ "The Trojan Women, Euripides". Classics.mit.edu. Retrieved 10 August 2012. ^ "Pausanias, Description of Greece 1, XXIII,8". Perseus.tufts.edu. Retrieved 10 August 2012. ^ Fields, Nic (2004). Troy c. 1700-1250 BC. Spedaliere, Donato and Spedaliere, Sarah Sulemsohn (illustrators). Oxford: Osprey. pp. 51–52. ISBN 1841767034. OCLC 56321915. ^ de Arbulo Bayona, Joaquin Ruiz (2009). "LOS NAVEGANTES Y LO SAGRADO. EL BARCO DE TROYA. NUEVOS ARGUMENTOS PARA UNA EXPLICACION NAUTICA DEL CABALLO DE MADERA" (PDF). Arqueología Náutica Mediterránea, Monografies del CASC. Girona. 8: 535-551. ^ a b Tiboni, Francesco (5 December 2017). "La marineria fenicia nel Mediterraneo nella prima Età del ferro: il tipo navale Hippos". In Morozzo della Rocca, Maria Carola; Tiboni, Francesco (eds.). Atti del 2° convegno nazionale. Cultura navale e marittima transire mare 22-23 settembre 2016 (in Italian). goWare. ISBN 9788867979042. ^ a b Eric H. Cline (2013). The Trojan War: A Very Short Introduction. ISBN 0199333823. ^ Stephen Kershaw (2010). A Brief Guide to Classical Civilization. ISBN 1849018006. ^ a b c d e Sparkes, B. A. (1971). "The Trojan Horse in Classical Art1". Greece & Rome. 18 (1): 54–70. doi:10.1017/S001738350001768X. ISSN 1477-4550. ^ Sadurska, Anna (1986). "Equus Trojanus". Lexicon Iconographicum Mythologiae Classicae. Zürich. 3, 1: 813–817. ^ British Museum. Dept. of Greek and Roman Antiquities; Walters, Henry Beauchamp (1899). Catalogue of the bronzes, Greek, Roman, and Etruscan, in the Department of Greek and Roman Antiquities, British Museum. Wellesley College Library. London, Printed by order of the Trustees. p. 374. ^ "Bronze bow fibula (brooch) with a glimpse of the Trojan Horse with wheels under feet - Images for Mary Beard's Cultural Exchange - Front Row's Cultural Exchange - BBC Radio 4". BBC. Retrieved 3 November 2017. ^ Caskey, Miriam Ervin (Winter 1976). "Notes on Relief Pithoi of the Tenian-Boiotian Group". American Journal of Archaeology. 80 (1): 19–41. JSTOR 502935. ^ Wood, Michael (1985). In Search of the Trojan War. London: BBC books. pp. 80, 251. ISBN 978-0-563-20161-8. ^ "Carnelian scarab | Etruscan, Populonia | Late Archaic | The Met". The Metropolitan Museum of Art, i.e. The Met Museum. Retrieved 27 November 2017.